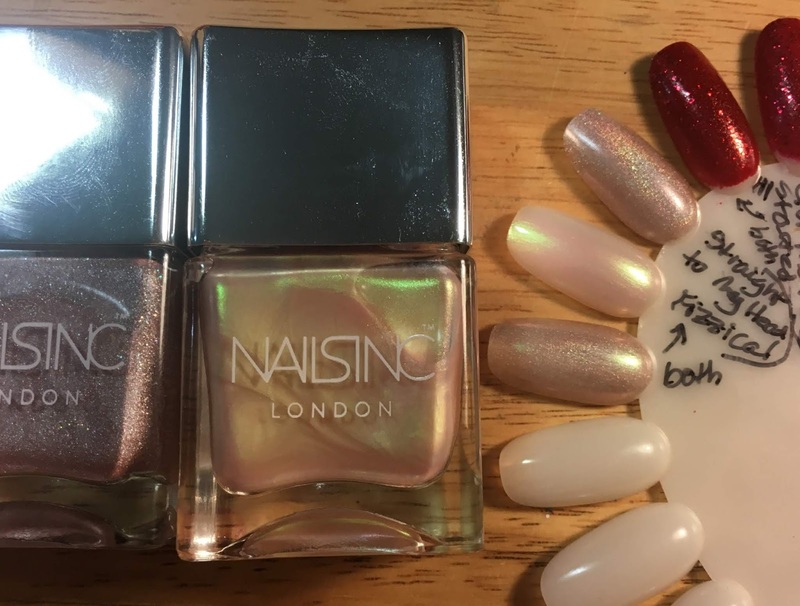 So I've been talking about the NailsInc polishes I got lately from Sephora - some of them were from the VIB sale but not all. Some of them I'm intending to return. I was trying to think of nail polishes I've returned, and there aren't many of them. Back in the day (and I mean way back), many/most stores wouldn't accept returns for anything that could have been opened. Walgreen's took some unopened polish still in the package, a couple of years ago. Nowadays I know that Sephora will take "gently used" returns (I know that's the way they phrase it because I looked at the official policy) and actually my understanding is that they interpret that very generously. But I really haven't ever returned much of anything to Sephora either. I think in this case I'm going to, though. 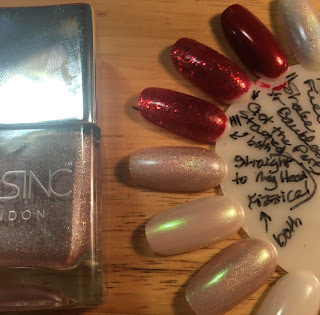 I ordered way too many polishes in a short time and I told myself (when I came down from the shopping high) that if I didn't love all of them I was going to return some, and well, I didn't love all of them. So here's one set that I am intending to return. 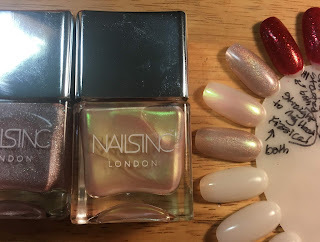 Obviously I did swatch these on the wheel, but I didn't put them on my nails at all so I'm assuming that should definitely qualify as gently-used! 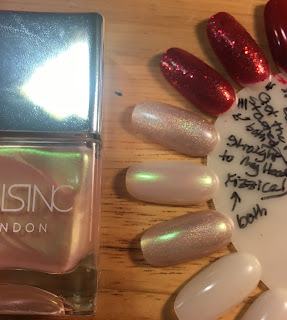 I swatched both of these separately (see below) and then both of them together - that would be the nail that says "both". The polish on the left - which I cropped to minimize the glare - is Straight To My Head (I keep getting that name wrong: Straight To My Heart, for one) and the other one is Fizz-ical. * Straight To My Head seems to me to go with the Holler-graphic polishes. It may not be exactly the same as those but it seems quite similar, at least. It's definitely got holo stuff and something like Spectraflair in it. And then Fizz-ical looks like it's got a similarly beige sort of base but it's also got a load of gold/green (?) shimmer in there. It's awfully sheer, though. I was hoping that both of them together might do something that would make me want to keep it, but meh. I actually like Straight To The Head by itself the best of the permutations I tried - although Fizz-ical over black looks green, which was kind of a surprise. It's got a green flip to it that I hadn't really noticed, although now that I'm looking it's pretty clearly there. *I don't know if they intended this or not, but "Fizz-ical" totally sets off Olivia Newton-John earworms in my head. "Let me hear your body talk..."
This is the one that feels like it has the same formula as the Holler-graphics, (linear holo, other holo glitter) except that it's so pale it's hard to be sure. But as far as I can tell the formula looks really exactly the same. 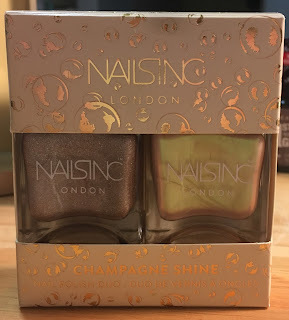 That duo is very temping I"ve been resisting it for a few months, I nearly ordered it when I got the Nail Pourn Duo which were very pretty. Glad to hear I wasn't wrong to ignore it since it sounds pretty boring up close.